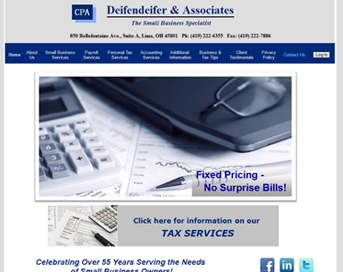 Designed by accountants for accountants with marketing and client services the primary objective! 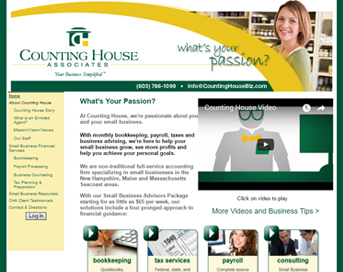 Websites specifically for accounting, payroll and tax firms. Turn-Key – Included at no extra charge with Secure Portals. Integral part of your Secure Portals. We help you select the design you want from a large selection of banners, backgrounds, graphics and styles. To help you get started, we provide dozens of template designs then provide you with the tools to easily customize it to match your firm’s image. Then we completely set the site up for you with several pages of content applicable to firms providing the services you provide. Your website will be up and running within a few hours of your order. We provide you with a Built-in HTML Editor and a Built-in Site Designer tool and on-line training so that you have the ability to customize and personalize your website as you desire – or contact us and we will help you with it. We handle the DNS and register your domain if you do not have one. Do-it-yourself tools for search engine optimization. Customized banners and other custom features are available at reasonable fees. Search engine optimization done for you by one of Dillner’s certified search engine optimizers. Business and tax tips videos produced by Jennings Seminars -a new one added every four to six weeks. Business and tax tips articles from which to choose. 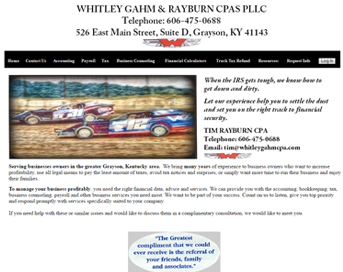 Totally Customized Website – Contact us today for an estimate. Personally designed website from the ground up specifically to meet your needs and desires by one of Dillner’s website consultants. Secure client login to your Portals. Copyright © 2017 Dillners. All rights reserved.